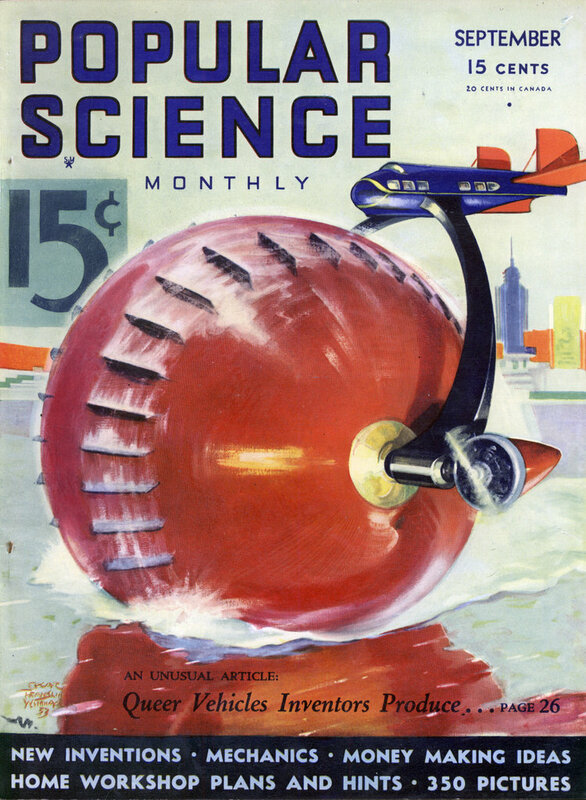 THIS diminutive “high striker,” to call it by the correct carnival name, will compete with baseball in interest when boys gather on the sand lot or in the back yard. It requires but little ground space and is just the thing, along with homemade “rides” and chutes, for staging a successful children’s carnival. In all but size the striker follows the construction of professional carnival and fair models. The similarity can be further carried out by offering big, long chocolate cigars for ringing the bell, if prizes of any kind are considered necessary. A pine board 3/4 by 5-1/2 in. by 10 ft. is ripped down to a width of 3-1/2 in., and the narrow piece cut away is then screwed on to stiffen the back as shown in the small drawing at the left. After a coat of shellac has been applied, the score numbers are lettered on the board a foot apart, and the whole is then varnished. A length of strong, polished brass wire is used for the track on which the counter travels. The wire is supported at either end with small corner braces, the tension being adjustable at the bottom by means of a threaded screw eye and nut as illustrated in the circle. The counter is a wooden spool having a hole slightly larger than the diameter of wire used. At the top a metal gong is fixed by means of a long threaded bolt, which can be seen at the top of the large drawing at the left of this page. Any long-handled wood mallet may be used. One may be made by boring or sawing a hole in three 1 in. thick blocks of wood and gluing them on the end of a heavy pole. The base of the striking board, shown in the large drawing, is of heavy construction, 12 in. wide and 2-1/2 ft. long. The striking arm, a strong, narrow board, is supported off center by two blocks screwed to the base. Cover the striking end of the arm with a piece of inner tubing, and place a small covered block immediately underneath so that the arm will have an inch of free play. Notches are cut in the other end of the striking arm and base to fit under the counter and around the brass wire track. In setting up the striker, the base is held with long spikes driven into the ground. The upright is supported by two narrow boards with bent angle irons screwed to the ends as in the small drawing. At the top these supports are bolted to the upright, and at the bottom they are spiked to the ground. After the device has been set up, the tension of the wire track may be adjusted so that a heavy hit by a young boy will send the counter well up toward the gong. If it is too sluggish, the track may be lubricated with vaseline. 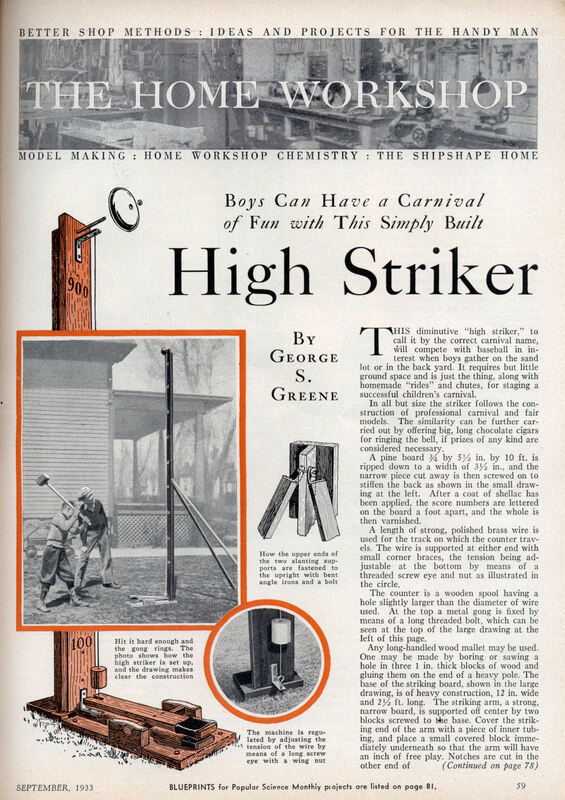 Only a very strong hit should be allowed to shoot the counter up far enough to ring the bell, but this can be regulated to suit the ages of the children using the high striker. I keep confusing it with something else. And Mr. Bush – this is a reproduction of an article from 1933. If you want to build your own and can’t suss it out from this article, there are plans available in many places – Google found this one (http://www.magicnook.co…) very quickly. But watch out for kids with lawyers. Isn’t there a free instructions page anywhere? The only link that appears to actually be instructions (magicnook) costs 5 bucks, which is antithema to DIY.